Lewis Hamilton made it back-to-back wins in North America by taking victory at the famous Indianapolis circuit in the Unites States Grand Prix, just a week after his Canadian triumph. Hamilton edged ahead of team-mate Fernando Alonso on the run to the first corner, the two McLarens soon distancing themselves from the pack as Ferrari's Felipe Massa headed the rest of the field. Alonso sat in Hamilton's wheel tracks, hoping to pressure the Brit into a mistake that never came. On another circuit new to Hamilton, his progress was impressive, rarely putting a wheel wrong. He had one a scare on lap 38, though, as he had slowed in traffic, partly due to a graining tyre, and had Alonso on his tail as they swooped out of the final banked corner. 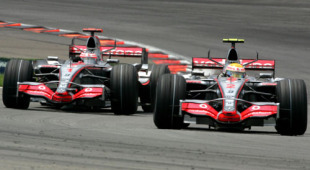 At 195mph, they ran side by side past the pits, just inches apart but Hamilton stayed ahead, Alonso his constant shadow. Behind them, Massa took third ahead of team-mate Kimi Raikkonen while Heikki Kovalainen was fifth for Renault ahead of Jarno Trulli's Toyota. Mark Webber gave Red Bull something to cheer about in seventh with Sebastian Vettel eighth in his first ever Grand Prix, the German becoming F1's youngest ever point scorer.